Backflow prevention devices, technically known as double-check valve assemblies, are important safeguards against contamination of the public water supply. Your residence receives water from the water main located in the street. Backflow can potentially occur when there is a drop in system pressure, especially a sudden drop (which could be due to water main breaks, damaged fire hydrants or water demand for a fire), or increased pressure from a non-potable source. 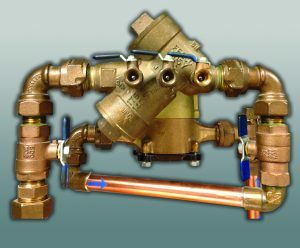 Without a backflow prevention device (BPD), water in home and commercial plumbing systems might be siphoned backward toward the street. Water main backflow devices, when properly installed and maintained, prevent the possible contamination of the public water supply, for example, through your lawn sprinkler system. These devices are an important and essential component of every automatic lawn sprinkler system and should be checked regularly. Please check requirements with our office when installing new plumbing systems and/or underground irrigation.